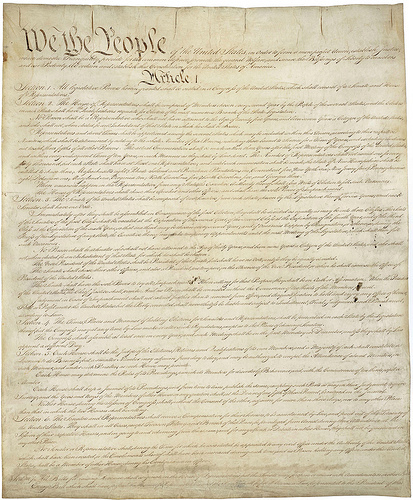 The message on the website’s home page says: “Welcome to We the People on WhiteHouse.gov. This tool provides you with a new way to petition the Obama Administration to take action on a range of important issues facing our country. A petition can be created by anyone 13 or older, so maybe we’ll see one outlawing weekend homework assignments or English lit requirements to read The Sclarlet Letter. Or maybe a national driving age of oh, say … 13! But what can it hurt? One of the earliest petitions to go up was one promoting a national health care system. It was created on Thursday, Sept. 22, the same day the website launched. A petition needs 5,000 signatures to get “noticed” by the administration and as of Sunday, it had a paltry 47. Average Americans have other priorities, though. Even a petition for allowing base jumping in national parks (i.e., jumping off cliffs and bridges with a parachute) had 847 supporters. You might expect petitions opposing the health care reform law, or pharmaceutical ads. And maybe those are coming. But for now, health care as a topic has garnered just two other petitions: “Legalize raw milk sales on a federal level,” and “Require all genetically modified foods to be labeled as such.” Both had more support than the national health care petition: 990 for the former and 1,949 for the latter. Someone suggested: “Make bribing politicians illegal.” That one had 435 signatures. Granted, the White House petition site, in the grander scheme of things, won’t mean much. It does give people an opportunity to vent. But even in this lowly context — and at least in the world of cyberpetitioners — health care as an issue seems pretty bottom-rung. A lot was made out of the Wolf Blitzer question at the Republican debate about the hypothetical 30-year-old uninsured man who gets sick. What is society’s reponsibility to him? Let’s call the man Joe. Republican/ Libertarian Candidate Ron Paul suggested that “the churches” take care of him, but no government money should be spent to help him out of his mess. Two points should come out of this discussion. It has to be broken down. There is emergency medical care, and there is preventive medical care. Paul is correct that if Joe is sick with an accute illness — let’s say he has developed e. coli poisoning from a bad burger — he would be admitted to a hospital and stabilized. He would not be left in an emergency room, uninsured or not, to die. He may not get five-star hotel treatment, and he’d probably be sent home early. It would be many weeks or even months before he recovered. Then he’d be looking at a dizzing array of medical bills that would basically end his financial life and that of his family. Bankruptcy might be an option. But there’s another form this could take. Doctors may find, during a routine medical visit, that one of the arteries to Joe’s heart is blocked. He can return to work, but he needs a bypass. And no church or community group is going to provide it. He might look at going to India or Colombia, where such operations are a fraction of what they cost in the United States. But there’s no charitable organization, that I know of, that offers bypass procedures to uninsured Americans. This is the real question for Ron Paul and his co-presidential aspirants. I would suspect they’d say Joe was out of luck, and would have to hope for the best. One day he’d collapse at work or in the car on the way home — and THEN he’d be taken to the hospital for treatment. But by then it would be too late. It also seemed to me that Mr. Blitzer and others played fast and loose with the figures when it comes to health insurance premiums. His statement about a policy that costs “$200 or $300” per month doesn’t ring true for most people who are looking for coverage on the open market. I went to the government’s health care website where you can punch in personal information and get quotes from insurers. I was quite surprised to find that there are policies for single men as low as $229 per month — although 10 percent of applicants get turned down and there’s a 9 percent surcharge. Other options, with the information I used, ranged from $188 per month with a $2,000 deductible (25 percent were turned down); to $409 per month with a $2,500 deductibe (42 perecent of those who applied for this plan were turned down). But the health care issue doesn’t revolve around single, healthy 30-year-olds. it’s married couples, families, seniors — kids who are born with disorders that need care right off the bat. When I used the government website to look for coverage for a family of of four with one pre-existing condtion, premiums shoot up to as much as $1,254 per month. And that’s with an annual deductibe of $1,000 plus an in-network, out-of-pocket limit of $5,000. There was a policy where “premiums start at at $1,327 per month” with an annual deductible of $7,500. Forty-two percent of people who applied for this plan were turned down. I don’t know about you, but whenever I purchase something and they say the prices “start at” I usually figure there’s a big fat catch. A new 2012 model car may “start at” $25,000, but does that include wheels, seats and an engine? Probably not but maybe I can borrow some from my church. You have to appreciate the irony that as communication technology continues to advance by giant leaps, the country – philosophically, socially and politically – is more splintered than ever. Political rivalries are as bitter as they were before the Civil War, some argue. Many wedge issues revolve around religion: gay marriage and abortion to name two of the most divisive ones. There’s plenty of back-and-forth on the cable news channels, but it’s mostly like-minded people talking with like-minded people, all complaining about the other side. This is the formula: an anchor or host from the left or right and two guests, usually an “analyst” already employed by the network to spew the accepted line. They may have one guest representing the opposition but this person is often a straw man – someone assigned to be a doormat for the other side, to the delight of viewers who have tuned in to have their point of view reinforced. It’s not debate and it certainly isn’t news. It’s theater, really. Nothing has been accomplished; there’s been no meeting of the minds. Why hasn’t the era of instant communication pulled society together? I was thinking about that and wondering what’s coming down the road. Used to be, you’d get up in the morning, walk out to your front yard to pick up the newspaper, wave to your neighbor and go back inside for breakfast. You’d look in the sports section for last night’s scores or in the business section to see how your stocks were doing. You were sitting at the table with people in your family and sometimes they were annoying, but they were there and so were you. Now, you already have looked up the scores on the web the night before and your teenage kids are in their room tweeting on their iPhones. You’re gulping down a cup of coffee by the kitchen counter and you say goodbye to your son as he sprints out the door to school. But he doesn’t hear you because he has his earphones in. Each generation has its own quirks and behavioral characteristics that bear strange and exotic fruit. The results cannot be predicted. The Depression/ World War II generation married in the late-1940s and ‘50s, built homes in suburbia and went on to raise a batch of kids who took disrespect for authority to dizzying heights. These kids grew up, got married, got divorced, got remarried and got divorced again, and issued forth a new crop of little Americans who became the most cynical generation to ever walk the planet. They are in constant contact with their circle of “friends” but in a way live in isolation. I was at the neighborhood supermarket last week when I saw something that put a sort of exclamation point on all of this. A twentysomething guy got out of the driver’s seat, went to the back door, opened it and took his toddler son out of his car seat. The surprise, to me at least, was that the dad had his earphones in. So much for the father-son chat. The Depression generation, the Boomers, Generation X, Generation Y, Echo Boomers. They’ve all left their marks on the culture. What will be the signature of the next generation? One can only wonder. Fall has finally arrived — and football is back, baby! By that I mean the political football that has become known as U.S. debt reduction. And the Super Committee – that’s no relation to the panel that is planning Super Bowl XLVI next February at Lucas Oil Stadium in Indianapolis – is going to meet in the next few weeks to begin identifying $2.1 trillion in budget cuts over the next 10 years. Medicare will be a major target, according to an analysis released last week by the Kaiser Family Foundation. The bottom line is that the Super Committee’s work has “potentially significant implications” for the popular program. As it is, Medicare was already hit by the Affordable Care Act (ACA) with $424 billion in cuts over the next 10 years, by reducing payments to hospitals and Medicare Advantage plans. If you’re trying to create a two-tiered system, one which caters to paying customers and those with good (expensive) insurance plans, and another that accepts Medicare patients, this is the way to do it. Health care providers can opt out of Medicare and the ones who are left will be those who, for one reason or another, are willing to work for less. Read into that what you will. But it looks like Congress will take another meat cleaver approach with the program at the end of the year. That’s when the Super Committee — composed of 12 House and Senate members — is scheduled to issue their budget reduction plan and send it to Congress for approval. If it’s rejected, automatic cuts will begin taking place in 2013. The IPAB is the Independent Payment Advisory Board, tasked with finding Medicare cuts if growth of the program exceeds targeted levels. So, at a time when Medicare is poised to cost more money because of the influx of Baby Boomers, instead it will actually shrink. Reading through this material, you get the picture that fundamental changes are ahead. To put it bluntly, a lot of people in the generation approaching retirement will forego health care because it simply won’t fit into their ultra-tight budget. How did we get to this point, and why hasn’t there been more of an outcry from the people who will be directly affected? Because until now, many people who enjoy a government benefit – whether it’s Medicare or something else – have been operating under the misconception that they aren’t actually federal program recipients. A paper released by Cornell University earlier this year showed how widespread this idea really is. It said 39.8 percent of Medicare recipients insist that, “No, I have not used a government social program.” This also applies to 44.1 percent of Social Security recipients, and even 28.7 percent of those who are on Social Security Disability. If you question people about it more closely, they’ll say: “I paid into it. Why shouldn’t I get my money out?” But that’s really the point: The people who paid into the program for decades, but haven’t yet accessed the benefits, won’t be getting their money out. On top of that, the cuts will also affect existing beneficiaries. So brace for a widespread impact. When you get to the two-minute warning, it’s a little late to change your game plan.